Well, Autumn is here and in a few more days, the roads of October will take us to Halloween. 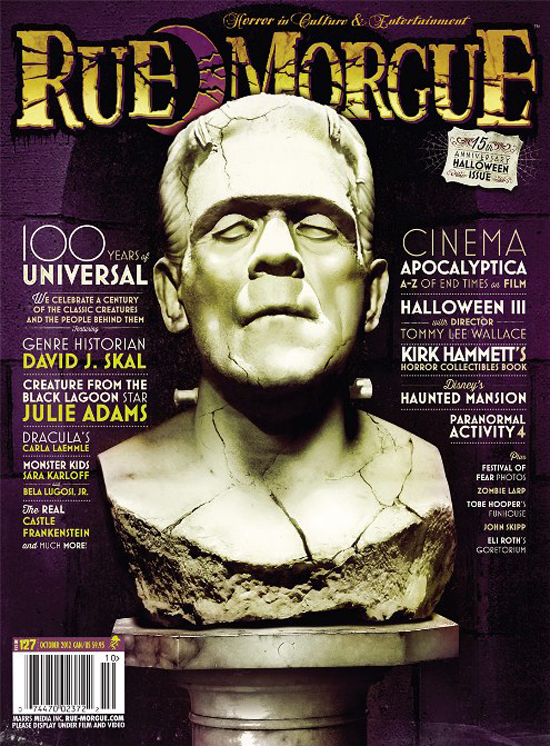 Kicking off the season in great style, Rue Morgue — consistently the best mass-market genre magazine — celebrates Universal’s centennial with a fantastic lineup that includes historian David J. Skal. 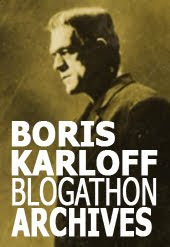 On the cover, a fabulous bust of Boris as Frankenstein’s Monster by Toronto-based artist Justin Erickson. Rue Morgue No. 127 will be available on newsstands and digital download on October first. 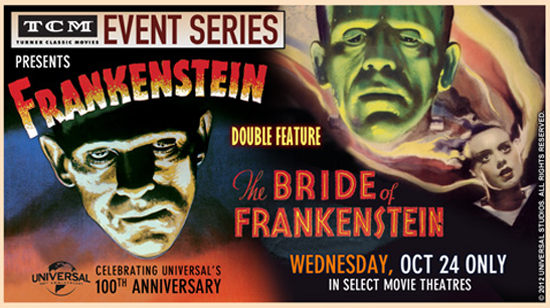 Boris, and Universal’s 100th are further celebrated next month as Turner Classic Movies host a special double-bill showing of Frankenstein (1931) and Bride of Frankenstein (1935) in selected theaters across America. This is a rare chance to see these classics on the big screen in sharp, remastered copies. The evening includes a recorded presentation by TCM stalwart Robert Osborne interviewing Sara Karloff, Bela Lugosi Jr. and makeup wizard Rick Baker. 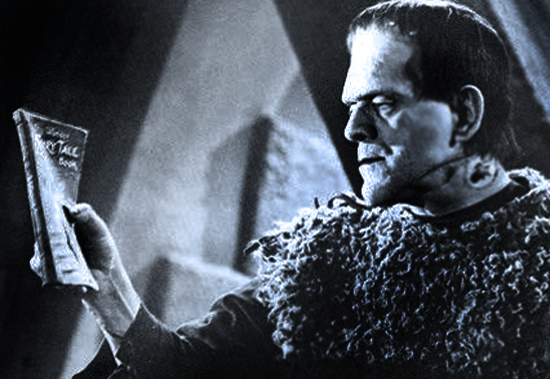 The one-time TCM Frankenstein Event happens on October 24. Check the Fathom Events website for details, a list of theaters, and tickets. And then, there’s Countdown to Halloween 2012 — hosted by the indefatigable team of John Rozum and Shawn Robare — where bloggers celebrate the spooky season every day, all month long. 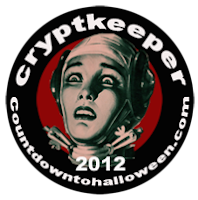 I’ll have a badge up on the menu that’ll take you to the Countdown site and, there, you can click through a long list of blogs and enjoy a boggling variety of Halloween-theme posts. There were over 250 participants last year! It’s great fun and a great way to discover new blogs. 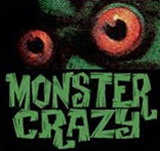 I’ll be contributing to the Countdown with our companion blogs — Monster Crazy, Frankenstein Forever — and here on Frankensteinia, where I will be running another Frankenstein Book Month. I’ll be posting here every other day, reviewing Frankenstein-themed books and showcasing eye-popping Frankenstein graphic novels, including many NEW titles! Join me, won’t you, for the Countdown to Halloween and Frankenstein Book Month, coming in ten days! Wonderful! I always pick up the Rue Morgue Oct. issue, because it's usually my favorite one of the year. And I'm always interested to see what makes the cover. I'm thrilled to see that Universal monsters is the focus feature! Looks like it's going to be another fantastic issue, can't wait to pick one up. I'm busy trying to ready myself for the Countdown, I'm looking forward to all your posts this October.